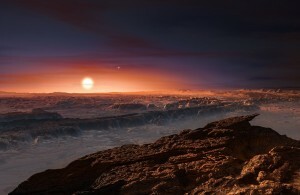 After a few weeks of rumours, the announcement of the discovery of an Earth-size (maybe!) planet around the Sun’s nearest neighbour has caused quite a stir. The planet is more massive than the Earth, but probably not by much, and sits in a location where liquid water could (at least in principle), exist on it’s surface. The detection was made by an international team using data, and relied on observations from a number of telescopes around the world. One of those was the Las Cumbres Observatory‘s network of telescopes, working as part of the Pale Red Dot campaign, as Edward Gomez explains in this month’s episode. Proxima b isn’t the only story. There’s also the happy news of the re-awakening of STEREO-B, a solar observatory that dropped offline a couple of years ago and has finally responded to NASA’s hails (more on that from Sounds Like Science). And there’s also the discovery of a Niku, a small object out beyond Neptune which is orbiting the Sun in the wrong direction. Originally broadcast on 25th August 2016 as part of Pythagoras’ Trousers on Radio Cardiff.